A lifelong friend of Martin Luther King, Jr. will be among a group of speakers visiting Bainbridge High School this week, as Martin Luther King, Jr. Day approaches. Rev. Samuel Berry McKinney and four other guest speakers will reflect on the legacy of King and the civil rights movement at the high school Wednesday. A public presentation will be held at 7 p.m. in the LGI building as part of the “Carrying on the Dream” program. McKinney attended Morehouse College with King in the 1940s and they remained close. 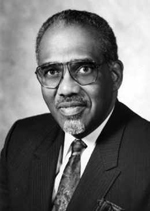 McKinney supported civil rights protests in Seattle in the 1960s as a pastor at Mount Zion Baptist Church. He organized King’s visit to the city in 1961 and later joined King for marches in Selma and Montgomery, Ala. Appearing with McKinney on Bainbridge will be Patricia Moncure Thomas, president of the Black Historical Society of Kitsap County; state Rep. Drew Hansen, author of “The Dream: Martin Luther King, Jr. and the Speech That Inspired a Nation;” Dr. Rosie Rimando Chareunsap, a 1995 BHS graduate and vice president at South Seattle Community College; and Ali Saunders, a BHS senior and president of the school’s United Brothers & Sisters Club. McKinney and Hansen will visit with Bainbridge classes during the day. The evening presentation is free and donations are accepted.